Prominent & Leading Manufacturer from Ahmedabad, we offer installaion of lightning arrestor, earthing installation and epc solar projects. Lightning Arrestor will protect Industries, Home and human being form the Lightning. 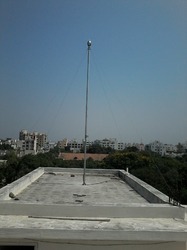 We will do installation Industrial & Domestic Lightning Arrestor with all accesorial Installation. q Augur/Drill/Bore a hole of 8 - 10 inch in diameter at a place where earthing is to be done, to a suitable depth of 2 - 3 meters (Electrode Length). qPlace the Earthing Electrode inside the pit. qMix the Back fill compound nicely with the soil, which has been dug out. q Re-Fill the empty space around the Earthing Electrode with this compound mix soil. q While re-filling the space, pour adequate water in the PIT intermittently. Pack the soil around Electrode tightly and nicely. We will do EPC Solar Projects. In that we will Do commisning & Installation of Solar Plant with Electriocal & Civil work.